Setting down a healthy yet delicious meal on the dinner table day after day is easier said than done. This is one of the reasons why families constantly search for wholesome recipes that are fast to cook, yet grand to eat. Despite busy lifestyles and demanding work schedules, individuals attest that curries highlighting lentils are a staple at their table. This write-up reveals the top four curries including the widely popular vegetarian dahl recipe that you can add to your weekly diet! Curries like these are the crowning glory of Malaysian fare. One of the greatest benefits of cooking such a curry is that it does not contain any additives as they are not processed foods. Pure and fresh, it highlights seafood, coconut, herbs, and spices that bring you a whole host of health benefits. Devoid of all preservatives or added colours, these still manage to entice diners. You may serve a bowl of prawn and coconut gravy with a smattering of steamed long grain rice. Ideal for a feast, the lamb curry is a staple in several cuisines. Especially found in Australian as well as Indian cuisine, this dish highlights slow cooked lamb. Apart from a nice cut of lamb, you may include heirloom tomatoes, crushed cloves of garlic, sautéed onions, and a pinch of ground pepper and nutmeg. While a lot of the options are not ideal for vegan cooks; the vegetarian dahl is perfect for them. A traditional option, the lentil dahl is packed full of nutrients and essentially resembles a thick gumbo. An outstanding selection for vegetarians as well as those who follow veganism, cooking dahl can help you cut back on the carbohydrates and embrace protein in your diet. Connoisseurs of Indian fare propose that you pair the Dahl with a naan or even a chapatti that is an Indian flatbread. 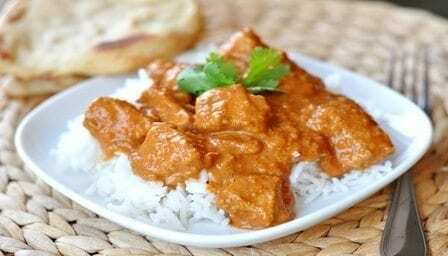 When it comes to Indian cuisine, certain archetypical choices like Chicken Tikka and Butter Chicken are popular globally. This is a dish you must try for it quite simply is grilled chicken cooked in a creamy butter. Laced with tomatoes and a touch of honey, this is devoid of all spices and suits any flavour palate. The next time you have company for dinner, you might want to serve up a traditional butter chicken curry cooked from scratch. Nutritionists suggest that the addition of these dishes to your meal plan can give your family the nourishment it seeks. Be it the vegetarian dahl dish or even a roasted lamb curry that you prefer, these dishes are sure to swiftly add flavour to your palate. « What’s the Perfect Spice Mix for Moroccan Lamb Shanks Recipe?